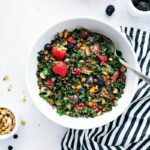 A powerhouse kale and quinoa salad made with quinoa, kale, fresh fruit, feta cheese, crushed pistachios, and dried blueberries. This kale and quinoa salad is easy to make and sure to be a hit! Author Chelsea, inspired by a Zupas restaurant "Kale and Quinoa Salad"
Combine the quinoa and water with a pinch of salt in a small pot. Follow package directions to cook the quinoa. Once cooked, remove from heat and allow to completely cool. Remove the coarse stems and discard. Take the kale leaves and finely ribbon the kale to have very thin and small pieces of kale. Place in a colander and wash well. Place the coarse sea salt on top of the kale and a few squeezes of fresh lemon. Massage and rub the kale with your hands for 1-2 minutes or until tender and a deeper green color. Rinse again and dry. Toss the cooled quinoa with the dry massaged kale. Rinse and dry the fruit. Remove the stems of the strawberries and slice or chop. Add to kale + quinoa mixture. Add in the whole blackberries and raspberries. Slice the grapes in half and add those. Add in the dried blueberries and chopped pistachios. Crumble the feta cheese over it all. Gently toss together all the salad ingredients. Add the dressing, toss, and then add more dressing as needed.